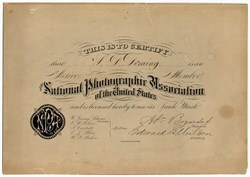 Beautifully engraved membership certificate from the National Photographic Association issued around 1874 for A.D. Deming. This historic document was printed by the American Banknote Company and has a vignette of the association's logo. This item has the signatures of the Association's President, Abraham Bogardus and Secretary, Edward L. Wilson. Abraham Bogardus (29 November 1822 Fishkill, New York - 22 March 1908 Brooklyn), was an American Daguerreotypist and photographer who made some 200 000 daguerreotypes during his career. He was trained in the Daguerreotype process by the New Yorker, George W. Prosch, who in 1839 had made a camera for Samuel F.B. Morse and on 28 March 1840 had advertised his first commercially available camera. Bogardus opened a studio and gallery at 363 Broadway in New York in 1846, becoming very successful. In 1868 he helped in the founding of the National Photographic Association of which he was President for five years. He worked as a clerk in a dry goods store in the late 1830s, and exhibited a painting at the American Institute in 1845. "Born on a farm in Dutchess County, New York, 29 November 1822, Mr. Bogardus came to New York City in 1837 and "took lessons" in the new art of Daguerreotypy from George W. Prosch in 1846. After two weeks' instruction he opened a Daguerrean Gallery at the corner of Greenwich and Barclay streets. During his first week in business he made only one portrait, the second week two, and in the third week none." "At that time sitting for one's portrait was quite an undertaking, the exposure time required being forty to sixty seconds. Very soon after, however, the time of exposure was shortened and the Daguerreotype became popular and Mr. Bogardus gave eighty or more sittings per week. Within a few years the paper photograph displaced the Daguerreotype, and the Bogardus Gallery was moved to Broadway and Franklin streets to meet the new conditions. During the first popularity of the Carte-de-Visite Mr. Bogardus kept three skylights busy and delivered from 68 to 100 dozens of Cartes per day." "Among his contemporaries at this time were Gurney, Mathew Brady, Lawrence, Insley, Hass, Harrison and Hill, the brothers Meade, Lewis, Bogert and other famous Daguerreotypists, now deceased." American painter Asher Brown Durand (1869) by Abraham Bogardus" In 1869 Mr. Bogardus was elected the first president of the National Photographic Association, and served, by continuous re-election, for six or seven years. During his long career in business he took an active part in the public life of the profession, and by his work and activities was widely helpful in shaping the present prosperity of the American photographer. He retired from active business life in 1887 and has since lived in quiet retirement in Brooklyn, an interested reader of current photographic literature and a frequent contributor to the St. Louis and Canadian Photographer and other journals." "With many of the older workers, Mr. Bogardus still believes the silver-plate Daguerreotype portrait the best thing yet achieved in photography, and it is a hobby with him to restore old and tarnished Daguerreotypes to their pristine freshness and beauty. Readers who possess any such Daguerreotypes and desire to have them restored (a difficult and uncertain task in unskilled hands) may safely entrust them to Mr. Bogardus, who may be addressed at 129 Herkimer Street, Brooklyn, N. Y." From 1847 to 1852, he was listed as a Daguerreotypist at 217 Greenwich Street. His residence was in Newark, N.J. from 1849 to 1851, returning to Grove Street, New York City between 1851 and 1852. His success enabled a branch gallery at 126 Washington Street, Newark, N.J. in 1849, which moved to 8 Clinton Street, Newark, N.J. in 1850. His New York City gallery was moved to 229 Greenwich Street in 1851 and the old Root Gallery at 363 Broadway refitted in 1862. He opened a new studio at 1153 Broadway in 1869, maintaining the 363 Broadway address. Wanting to retire in 1884, Bogardus advertised in the Philadelphia Photographer: "Wishing to retire from the photographic business, I now offer my well-known establishment for sale, after thirty-eight years' continuous existence in this city. The reputation of the gallery is too well known to require one word of comment. The stock of registered negatives is very valuable, containing a large line of regular customers, and also very many of our prominent men, Presidents, Senators, etc., and for which orders are constantly received. They include Blaine and Logan. Entire apparatus first-class; Dallmeyer lens, etc. For further information, address Abraham Bogardus & Co., 872 Broadway cor. 18th St., New York." The National Photographic Association And Its Convention In Chicago. National Photographic Association and its Convention in Chicago.�The convention and exhibition of the National Photographic Association for the year 1874, being the sixth of that useful institution, is now among the things of the past. All things considered, it was a grand success, and much good will result from it. I give you a synopsis of all that transpired, without waiting for details. The Association will issue a full report presently only to subscribers. I arrived upon the scene several days before the opening, and found the photographic fraternity of Chicago all absorbed in their preparations for the great event. Local Secretary Hesler was busy superintending the erection of " space" for the exhibition of the pictures and of merchandise, and the decoration of the splendid exhibition halls. His assistants were busy receiving cases of goods in great numbers from all directions, and the scene was a most animated one. I visited several galleries, and found the work of preparation going ou with like vigour. The stockdealers, too, were vieing with each other to see who could make the best appearance, in order to attract the photographers Thia pleasant spirit was kept up during the whole week, as I can testify from pleasant personal experience. Tuesday, the eventful day for the opening of the Convention, arrived, and promptly at ten a.m. President Bogardus sounded the gavel, and proceeded with the business of the association. After the address of welcome by Local Secretary Hesler, and the response of the president, routine business was taken up. The report of the execative committee was an interesting one, as it gave the doings of that body between conventions, and made several important suggestions, one being with regard to the election of officers, and the other concerning the failure of the members to pay their dues, and the consequent debt of the association. The treasurer reported the association $3,556 in debt. His accounts were referred to an auditing committee, and reported correct. As recommended by the executive committee, preparations were now made for the election of officers. Messrs. Landy, Hall, Knight, South- worth, and Fitzgibbon were appointed as a committee to make nominations, to report at the afternoon session. They were instructed to report a multiplicity of candidates for each office. Tuesday afternoon was devoted mainly to discussions on photographic practice, Mr. E. M. Collins taking the lead on the " Causes of the Discolouration of Prints." He was followed by Messrs. Bowdish on " Lighting and Retouching," Lockwoodon " Making Good Pictures," Rulofson on "How to Push Business," Webster on "Manipulation," Loomis on the "Dignity of Photography,1' Hough on "Art Education," &c. The remarks and addresses were all models of terseness and practical usefulness. The report of the nominating committee followed. Tellers and judges were then appointed for the election fixed for the evening session, and the tellers were instructed to prepare tickets and distribute them. All this preparation was made, instead of the election being held as heretofore, in order to prevent the insinuations so prevalent that the elections were not conducted fairly. Mr. Bogardus peremptorily declined serving another year as president. Mr. Bell made an address eulogizing Mr. Bogardus for his faithful service in behalf of the association, and in favour of Mr. Rulofson for president. The session closed about six p.m., and as the members dispersed, for the first time they learned of the dreadful fire which had been raging near .by for over two hours. The smoke was flying in dense clouds over the exposition building, and caused great consternation all around. Great fear was entertained that the sixth exhibition of the National Photographic Association was doomed, and that before long the thousands of beautiful photographs displayed would be in ashes. Certainly no fashionable assemblage gathered there as was expected to see them, and all any of us could do was to watch and wait. Now the wind would drive the flames over us in fearful sheets, and following a rain of sparks and burning wood. At midnight it was thought best to remove many of the goods, and several exhibitors, desiring to be on the safe side, took the precaution to place their pictures, &c., out of danger. In the morning we were delighted to find the building unharmed. The goods removed were replaced, and in a few days the exhibition halls looked as bright and beautiful as on the day before. But the fire had broken the spirit of enthusiam, and there was a general anxiety to get away. However, those who did not flee the city, gathered together in the morning, and business was proceeded with as usual. But the backbone of the convention and exhibition was broken. Wednesday morning the first order of business was the reading of the report of the committee on the progress of photography. This was followed by the appointment of a committee to fix the location for the next convention, and then Mr. W. H. Rulofson made a stirring appeal to the convention to remove the debt then, there, and now. He was followed by others, and it was resolved to take up the matter on the morrow. Other routine business followed. In the afternoon, Mr. D. H. Cross, the skilful operator for Mr. C. D. Mosher, of Chicago, and a gentleman well known by his inventions, made an address on general photographic practice, and he was followed by Mr. C. E. Meyers, in an essay on photographic screens, which was elaborately illustrated by models. Minor practical discussions were entered into, and then Mr. John R. demons gave one of his inimitable " talks" on photography in general, and some branches of it in particular, lie then answered the catechizing of the members until time for adjournment. The day was intensely hot, and was a fail- test of the earnest desire of the visiting photographers for knowledge pertaining to their work. Permanent Secretary � Edward L. Wilson. Executive Committee�W. Irving Adams, A. Bogardus, A. Hesler, V. W. Wilcox, I. B. Webster, J. W. Black, W. H. Rhoads. Committee on Progress of Photography � A. S. Southworth, W. H. Sherman, J. Landy, A. Gardner, Dr. II. Vogel. G. Wharton Simpson, M.A. And one Vice-president from each state and territory. Thursday morning President Bogardus made his closing address, and welcomed his successor to the chair amid great applause. Mr. Rulofson made an address which won the whole convention over to him, anoT we could see by the faces of those present that they meant to support him. He will prove a most worthy incumbent of the office, which, he said, he considered " next in honour to that of the presidency of the United States. Mr. Loomis offered resolutions eulogizing and thanking President Bogardus for his service. The permanent secretary and treasurer elect being called upon, each made a brief address. To Mr. W. W. Gillis, Rochester, N. Y., was awarded the gold mednl for the best display of frames ; and to Messrs. Robinson and Cherill, of England, the gold medal for the best display of photographs from England. Mr, Bell now moved that the subject of the debt of the association be taken up, and made an address on the subject. He was followed by others, when time for adjournment arrived. President Rulofson said the debt would be made the order of business for the first half hour of the afternoon session. Mr. Clemens, chairman of the Scovill and Holmes Medal Committee, reported that the committee had awarded the Scovill (gold) medal to Mr. W. G. Entrekin, Manayunk, Pa., for his oscillating eaameller ; and the Holmes (silver) medal to Mr. L. V. Moulton, Beaver Dam, Wig., for his improved photo washer. Adjourned. As announced, the first half hour of the afternoon session was devoted to the debt question. President Rulofson made a strong appeal for its removal, and others spoke on the same score. Many contributions then fiowed in; a large demand was made for tickets in the " mammoth offer" enterprise, and about twenty were made life members, the whole amounting to nearly a thousand dollars. For a first effort this was very handsome. Mr. Bowdish gave two of his camera stands, which were quickly purchased ; Messrs. Anthony and Co. gave a large camera box and stand, and there were several other gifts, which brought out the crowning one from Mr. Rulofson, of all the elegant pictures which he had on exhibition, and which, he announced, he would sell to the highest bidder in the evening. The permanent secretary, not knowing what Mr. Rulofson's auction sales would amount to, agreed to give one dollar more towards the debt, on a risk. One thing was most convincing, and it was worth more than all the money to see it, namely, that the members of the National Photographic Association value it, appreciate and see the good it is doing, and are determined it shall not fall. We congratulate them on their wisdom. The committee on location for 1875 reported in favour of Boston, with Mr. J. W. Black for local secretary. Mr. Black was present, and made graceful acknowledgment, the usual promises, &c.
Mr. J. H. Tomkins, Grand Rapids, Mich., addressed the convention at length upon the status of the sliding-box patent, and wan followed by Messrs. Southworth, Bell, &c.
A very pleasant feature of this session was the presentation to President Bogardus of a handsome solid silver pitcher and pair of goblets, as a token of their regard, by a committee of members of the association. Mr. Bogardus received it in his usually graceful style. Friday morning, the first thing taken up was the reading of Mr. S. Lockwood's carefully prepared report on a Life Insurance League, and the formation of a Photographic tire Insurance Company. These interesting matters deserve the attention of all photographers, and we recommend their careful reading. Both matters were referred to a new committee, to report next year. Professional Photographers of America is the largest non-profit association for professional photographers in the world. In spite of the name, membership is not limited to America. Currently there are more than 17,500 members in 64 countries. This organization was formed in April 1880 as the Photographers Association of America, Inc., by members of the Chicago Photographic Association and the National Photographic Association. The name was changed to Professional Photographers of America, Inc. (PPA), in 1958 to distinguish the association from emerging amateur photography organizations. In 1993 the Association moved its headquarters from Chicago to Atlanta. The Professional Photographers of America, Inc., a worldwide association, exists to assist its members in achieving their professional, artistic, and fraternal goals; to promote public awareness of the profession; and to advance the making of images in all of its disciplines as an art, a science and a visual recorder of history. For more information, visit www.ppa.com. PPA reaches out to its members, the community, and the industry in a variety of ways. Business Advice: PPA�s Studio Management Services (SMS) was designed to help members improve their profitability and long-term financial success. The program was developed as a consulting service that would provide sound business and financial advice. Business Protection: To help members save time and lessen frustration, PPA has shopped the insurance market and worked with companies to develop policies that cover photographers� special needs. Such protection includes an All-Risk Equipment Insurance Policy and the unique Indemnification Trust, which helps members facing malpractice situations. Continuing Education: Year-round educational programs are offered in the form of photographer-led seminars and workshops, affiliate school classes, and specialty conferences (focusing on marketing, finance, etc). Chicks Who Click, Super Monday, Make More Money in Photography Conferences, and Studio Management Services workshops are just a few of the fun and educational offerings. Convention and Tradeshow: Imaging USA began in 1884 as the annual convention and trade show for Professional Photographers of America (www.ppa.com) and is the longest running national photographic convention, expo and image exhibition in the United States. It provides a forum for professionals to network with and to learn from the best photographers in the world. The accompanying tradeshow offers a look at the latest technologies and products available to the professional photographer. In 2006 Imaging USA became home to two new conferences: SEPCON (the Sport and Event Photographers Conference), the annual conference of the Society of Sport and Event Photographers (www.sepsociety.com), and the Commercial Photography Conference, the annual conference of Commercial Photographers International (www.MyCPI.com). In 2006, Imaging USA also welcomed Adobe as an official sponsor of the Adobe Photoshop and Lightroom for Photographers track. With a 400+ booth industry expo, 65 educational sessions, and the international print exhibition, Imaging USA has established itself as the first major photographic event of the year. For more information, visit www.ImagingUSA.org. Copyright Protection: PPA works tirelessly with government agencies and other associations to protect the images created by professional photographers from both willful and negligent violations of federal copyright laws. PPA is also the creator of the Copyright Defense, a grassroots lobbying effort for copyright protection. Master of Photography (M.Photog.) Master Artist (M.Artist) Master of Electronic Imaging (MEI) Photographic Craftsman (Cr. Photog.) Certification is available to PPA members through the Professional Photographic Certification Commission, the leading certifying body for photographic and other imaging professionals in the world. They currently have over 1,500 professionals that have earned the Certified Professional Photographer credential. Online Forum: OurPPA.com is a professional community of forums and galleries created and hosted by PPA as a service to professional photographers. Designed to facilitate networking and communication about subjects that interest you, OurPPA.com strives to draw photographers around the globe together. The site is free and open to any professional photographer. Visit OurPPA.com for more details. Publications: PPA publishes Professional Photographer magazine, which celebrated its 100th year in 2007. Born in 1907, Professional Photographer is now the largest paid circulation magazine in the professional photographic industry and the official publication for Professional Photographers of America. No other magazine offers a more influential presentation of the people, trends, products, and photographs changing and defining the portrait, wedding and commercial photography landscape. Subscriptions are included with PPA membership and are also available to non-members. Visit www.ppmag.com for more details. 1880 The Chicago Photographic Association and former members of the defunct National Photographers Association join forces to form the Photographers Association of America. PAA would become PPA in 1958. PAA holds its first conference with 237 attendees. James F. Ryder of Cleveland elected as the first president. Revolutionary gelatin dry plate process demonstrated for the first time the. PAA's endorsement establishes the dry plate as the standard professional material. 1888 George Eastman introduces his Kodak camera and processing services at the PAA convention. 1906 During the annual convention, PAA develops photographic salons, which eventually led to the establishment of the current PPA International Print Competition and the Traveling Loan Collection. 1908 Color photography unveiled at the PAA convention. 1909 First meeting of PAA's governing body, the Congress of Photography, at the national conference in Rochester, NY. 1922 Winona School of Professional Photography inaugurated at Winona Lake, Indiana, in a building donated by the Daguerre Club of Indiana. 1927 Through advertising, the association grows into a trade organization. The Pathfinder becomes the official association journal, later renamed The Pathway. 1929 The National Council replaces the Congress as the governing body for PAA. 1930 Golden anniversary is celebrated. Artificial photographic lighting demonstrated at the PAA convention. 1934 Charles Abel changes Abel's Photographic Weekly to The Professional Photographer. 1936 Abel, James Caufield and Fred Bill institute the Merit Degree program. Approved in 1937, it establishes the degrees of Honorary Master, Master of Photography, Photographic Craftsmen, and Photographic Specialist. 1937 The Directory of Professional Photographers, a list of members and an almanac of professional photographers, is published. 1950 First issue of National Photographer published. Because it is officially part of the Charles Abel's estate, Professional Photographer is discontinued as the official PAA publication. 1953 PAA by-laws changed to allow an Industrial Photography Division. 1958 PAA becomes Professional Photographers of America, Inc. (PPA) to dispel public confusion between it and amateur groups. PPA begins the Qualified Program for commercial and industrial photographers. In February, PPA joined the affiliated Mississippi-Alabama Associated Photographers (later renamed the Professional Photographers of Mississippi-Alabama) and the University of Mississippi to hold the first professional photography conference with joint participation from a local association, national association, and major university. 1961 Professional Photographer is purchased from the estate of Charles Abel, and the National Photographer is renamed the National Professional Photographer. The name later returns to simply Professional Photographer. 1964 Land is purchased in Des Plaines, Illinois for the first permanent home of PPA. 1966 PPA headquarters opens in Des Plaines, Illinois. 1968 Architectural Photographers Association merges with PPA. 1973 PPA established the Specialist degree for retouchers and artists. 1974 PPA produces the first Buyers Guide for members. 1976 PPA creates the Errors and Omissions Trust (now known as the Indemnification Trust), offering affordable malpractice-style protection for members. 1977 PPA introduces the certification program. 1984 PPA opens a $3 million facility to house the Winona School. 1985 PPA establishes the World Council of Professional Photographers. 1989 PPA wins copyright infringement case against Eckerd Drugs of Texas. 1992 PPA's first female president, Evangeline Chase Parker, takes office. 1993 PPA headquarters and the Winona School move from Chicago to Atlanta. 1994 PPA wins copyright infringement case against Linn Photo. 1996 PPA introduces the World's Greatest Storytellers, the first national branding campaign for professional photographers. 1997 PPA holds the first Digital Imaging & Video Conference. 1998 PPA creates PPA Charities, a nonprofit charitable organization dedicated to assisting children and families in need. 1999 PPA unveils their re-tooled professional conferences: Digital Power, Power Tools, and Imaging USA. PPA announces partnerships with The Knot (www.theknot.com), Robert Faber's Photoworkshop (www.photoworks.com), and Collins Knowledge Network. PPA settles copyright infringement case with K-mart of Michigan. 2000 PPA renames its annual international convention Imaging USA. 2001 PPA takes a more active role in protecting photographers� rights with the creation of the Copyright and Government Affairs Department. PPA actively lobbies on behalf of photographers on Capitol Hill. Visit www.copyrightdefense.com to learn more about their efforts and results. 2002 PPA presents a copyright deposit reform proposal to U.S. Copyright Office. 2003 PPA testifies as a witness in favor of the Piracy Deterrence Act before the House Judiciary Subcommittee on the Courts, the Internet and Intellectual Property. PPA expands its lobbying efforts to include health care reform for small businesses. 2004 PPA�s Board of Directors travels to Washington, D.C., to meet with members of Congress and the executive staff of the U.S. Copyright Office. 2005 PPA celebrates its 125th anniversary. After more than 100 years, Imaging USA moves from July to January, becoming the first major photographic event of the year. PPA issues comments in response to the Copyright Office Notice of Inquiry on Orphan Works. PPA participates in industry-wide Copyright Office Roundtables on Orphan Works. PPA launches new online community, www.OurPPA.com. PPA establishes $200,000 Disaster Relief Fund for PPA member photographers affected by Hurricane Katrina. 2006 Imaging USA in Austin, Texas, draws record-breaking attendance of nearly 7,000 photographers. 2008 Imaging USA in Tampa, Florida, breaks all records with over 8,000 attendees and a 600+ booth tradeshow.